Sarah K. Benning is an American fiber artist with a home base in Keene, New Hampshire. Originally from Baltimore, she attended the School of the Art Institute of Chicago and received her BFA in Fiber and Material Studies. Shortly after graduating in 2013, Sarah discovered her love for embroidery almost by accident and the hobby quickly turned into her full-time career. Sarah primarily works from home in New Hampshire, though embroidery workshops, markets, and exhibitions take her out on the road quite often. Over the course of several years and lots of trial and error, Sarah has developed a very distinct embroidery style and aesthetic. 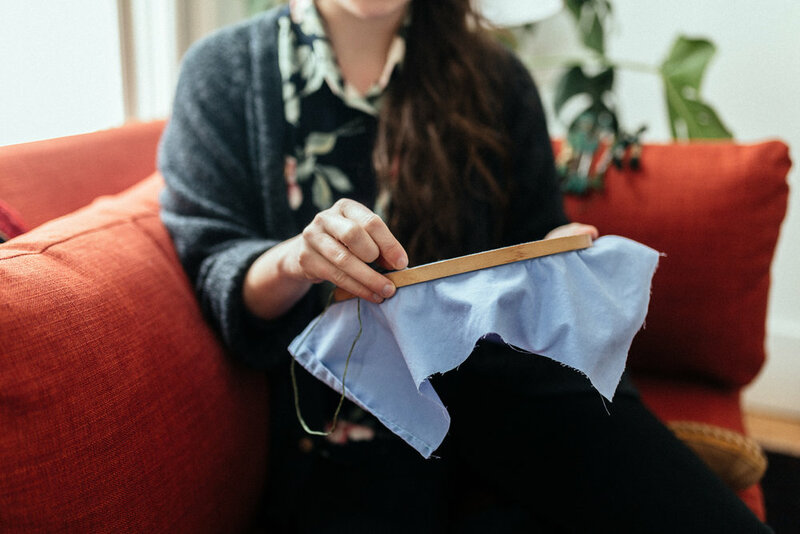 In addition to exhibiting and selling finished pieces, Sarah shares her love of embroidery through a monthly Pattern Program and occasionally teaches workshops and master classes all over the world. For more information about Sarah's process and materials, please the FAQ page.